The adult moths of this species have brown forewings, each with a lot of white spots, and a darker brown line around the costa and margin. 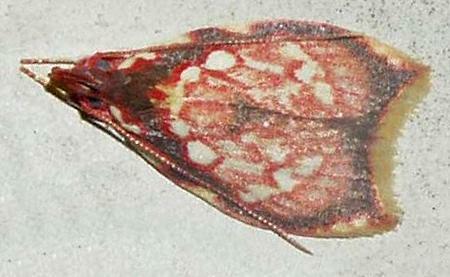 The hindwings are shiny white with a brown area around each wingtip. The wingspan is about 1.5 cms. CSIRO Publishing, Melbourne 1994, p. 82. Volume 1, Part 7 (1914), pp. 220-221. LeapFrogOz, Kuranda, 2015, p. 182.